Ireland has hundreds of stone circles scattered across its landscape. Some are nearly in tact, some have been carefully rebuilt, while most have just a few stones left – making them fragments of their former glorious selves. Most of these circles have been standing in place for 3000 to 5000 years. The stones are dug into the ground almost as deeply as they rise above it. Circles usually had a defined entrance between two stones, and the arrangement of the stones was often related to the path of the rising and setting sun at sacred times of the year. Many of the circle are in geographic alignment with other circles, hills and sacred sites. Some – though not all – were tombs. Stone circles are fascinating. They’re shrouded in so much mystery in that no one really knows their purpose, how they were used, how the stones got to these often inaccessible locations. Historians and archeologists can only guess. Most suspect the circles were places of ritual – sacred places to the people who used them. But they may also have served as calendars to calculate the seasons. 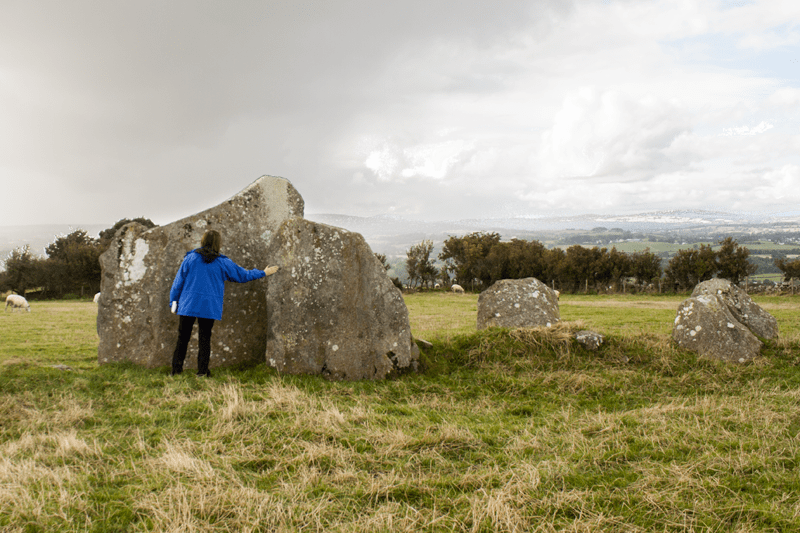 I’ve only visited a meager thirty stone circles in Ireland – not even scratching the surface. I’ve read a lot about them, taken friends to see them and included them on my thin places tours. I find that most people won’t go out of their way to find a stone circle. And access to them often requires hiking up steep hills, or trudging through bogland in mud up to your knees. They’re not always easy to get to. But I have never seen any person approach a stone circle who was not moved. There is something sacred about these ragged relics clinging to their ancient delineations in the landscape. Their energy – their pull. They are remnants of the past that swiftly connect us to it. We’re immediately engaged with the ancestors of that particular place who left behind more than these standing stones. Maybe that connection is the magnetic draw. I remember hearing John O’Donohue say that stones hold the memories of the past. The memories are almost palpable in stone circles. Each circle has a story to tell, and it seems to be present, just under the surface of the physical world. It peeps through the veil that separates this world from the next and begs you to ask … who lived here? Who moved these stones? What was the prayer of the people? Who died here? Why did they leave the circles? There is an singular energy about the stones and how they come together in a particular place. I tend to remember my first impression of stone circles. Each has a character about it. And just as visiting a holy site can evoke change in a pilgrim, a stone circle can leave an imprint on your soul – like an old friend. I remember the surprise I felt when I stumbled onto Uragh stone circle, and the joy I felt later at bring others to see it. The exhilaration of finally finding Cashelkeelty sticks with me, and I relive just a little of it each time conjure up my memories of walking the Green Road across the Beara to find it. Each circle carries its own unique power and energy, so powerful that its easy to return to them later in your mind. I’ve posted images of some of my favorites here in this post. I so love Cashelkeelty. In sits on an ancient track called the Green Road that runs down the center of the peninsula through the mountain passes. When I set out to find Cashelkeelty I was alone, walking in bad weather. It took forever to reach it. I nearly turned around twice, fearing it was just too far. But when I saw the first stones on the ridge I nearly cried. There are actually two circles there. The site is totally isolated on wide plateau with panoramic views. I made friends with those old stones. Just before I left a big ol’ rainbow stretched across the sky. 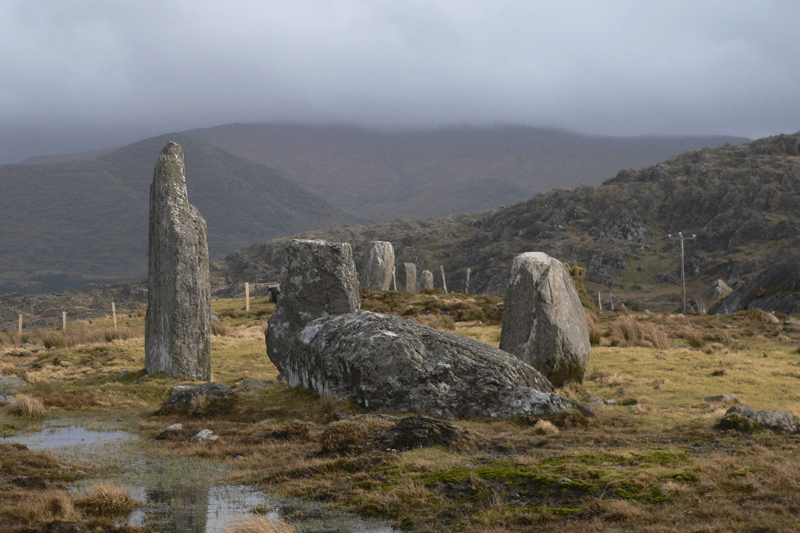 Uragh Stone Circle is also on the Beara set on a kind of plateau that sits above the valley. It’s surrounded by a ring of mountains with subtle waterfalls streaming down the sides.. It has a special grace about it, and the stones radiate a warmth, a kind of vibration. 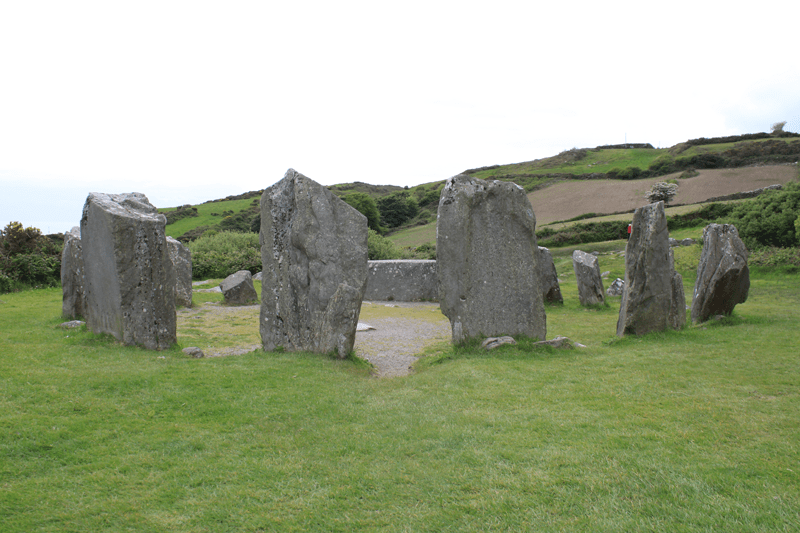 Drombeg Stone Circle is another favorite of mine. It has been rebuilt, making it easy to see how the circle was used. The entrance between two large stones (see photo) is directly across from an axial stone which is positioned in line with a notch in the hillside behind it (visible in the photo). On the winter solstice (Dec 21 – the shortest day of the year), the setting sun dips just under the notched ridge – a little east of the notch. But as the earth moves the sun reappears through the notch, pouring rays through in near perfect alignment with the axial and entrance stones. The concentrated rays shoot directly across the center of the circle. People who’ve seen this say that it looks as if for a few moments, the circle itself is illuminated independently of the surrounding landscape. Drombeg also has the remains of prehistoric huts nearby that were used for food preparation, probably for the whole community, which tells us this stone circle was probably positioned right in the community. 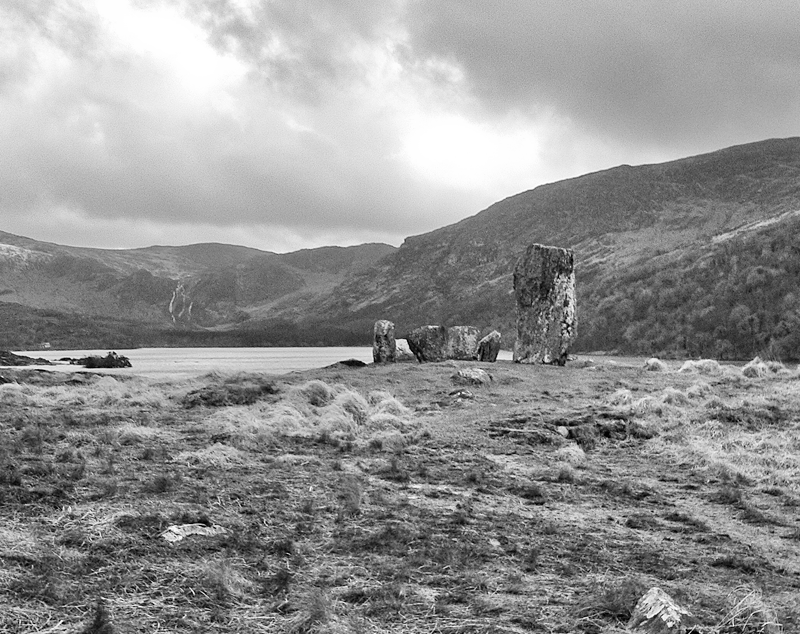 Beltany Stone Circle in County Donegal is new favorite. It’s a large one – 145 feet in diameter with 64 of the original 80+ stones still in place. The stones range in height from 4 feet to 9 feet high. And there is an outlying 6 foot standing stone placed in the field about 60 feet away toward the south east. This is an amazing circle because it’s almost too big to take in at first site. A shaded – almost forested path leads up the hill to Beltany. 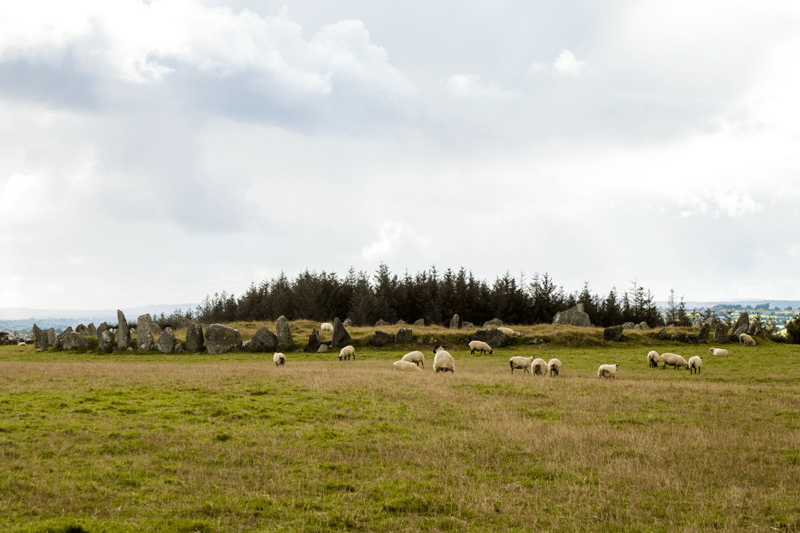 At the end of the path you come into a clearing – and there it is in the distance – across the field, among the grazing sheep, standing as it has stood for over 5000 years. Some of the stones have carvings on them and some have cup marks. It’s name, no doubt is linked to the sacred feast of Bealtaine marking the beginning of summer. I’ll never forget that first look at Beltany. I feel it the same – though to a lesser degree – each time I look at the photo. Other favorites of mine are Beaghmore in County Tyrone – the mother of all stone circles, Beaghmore has seven circles in one site. Castleruddery in County Wicklow with it’s notched and carved stones loosely arranged the a field of hawthorn trees is another favorite. And the Grange stone circle near the enchanted Lough Gur in County Limerick is glorious circle with amazingly strong energy. I look forward to discovering more of these old relics. 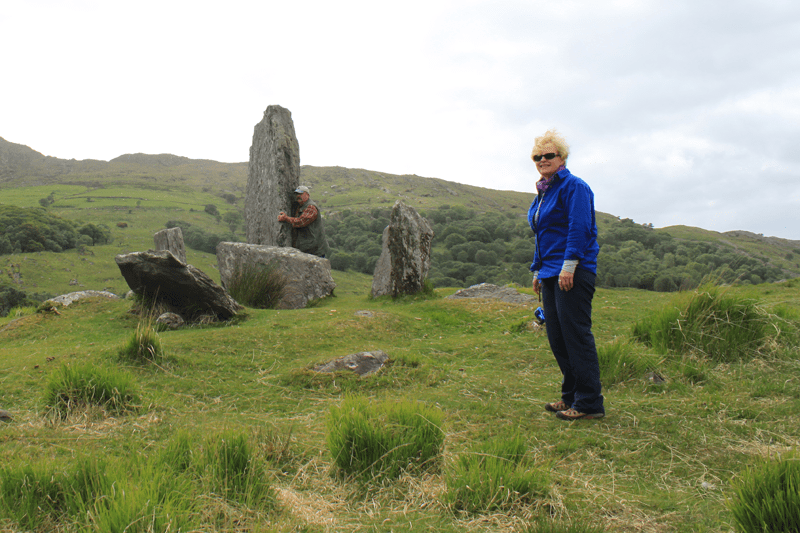 What’s your favorite stone circle? I just heard the term “Celtic thin place” for the first time (referenced in an episode of “The Unexplained Files” about the mystery of Overtoun Bridge, near Dunbarton, Scotland, decided to research, and found your website. The word Overtoun in Celtic mythology means a place where heaven and earth are said to be close. The literal translation is The Thin Place. Are you familiar with that location? I was also wondering if you think that perhaps sites located in Sedona, Arizona, for example, might be considered thin places. Any thoughts on that? Hi Barbara. I don’t know why I never saw this comment up until now. I don’t know Overtoun Bridge, but I’m going to Scotland again next year and I’ll look it up. It is a mystery … this “thin place” stuff, but the more thin places I visit, the more I’m convinced that some places just vibrate with a certain energy that begs for connection. Thanks so much for visiting the site and taking time to comment. and the large graves on the edge of the pennisula near Sligo are magical. I have crawled in and out of those tombs many times and felt sensations I cannot describe. One can also climb to the unexcavated cairn of Maeve or Queen Mab as some call her and see from there the cairns from Carrowkeel and other sacred mountain tops all lined up. Of course, you must have a clear day. Sorry to ramble, but this is something I do every year. I go on retreat to Ireland, and walk and walk and walk. I go all over, but am always drawn back to visit the Burren in county Clare which has many, many unexcavated sites that are magical. This is where John O’Donogue was from, and the folks I stay with there often attended his ceremonies at the ancient Corcomroe Abby ruins. There are two holy wells and the remains of an ancient settlementment in the immediate area. One of the wells I go to every year – it overlooks Galway Bay and is not hard to get to, but so very powerful. Thanks so much for taking the time to share your insights, Susan. I know all those places very well. Next time you’re in Clare, swing over to Mountshannon and look up Ger Madden. Ask him to take you to Holy Island and pay whatever it costs. (shouldn’t be too much). All these years I’ve been traveling to Clare, I didn’t know about this island or its history. Going without Ger (you need a boat anyway) is possible, but he gives so much of the history and links to the ancient Celtic traditions. It was one of the best things about our tour last year. We’ll be back in the north next year covering sites in Donegal, Derry, Tyrone, Fermanagh, Armagh, Antrim and Down. I visited many new sites last year in the north preparing for the 2013 tour. Again, I was amazed at what I didn’t know. I’m so eager to share information on those sites as this year progresses. Wow, Susan. That is a coincidence. Glad to have both of you as occasional readers. I wan to visit my the lands of my Scottish, Irish, and Breton/German Heritage. I need a vacation. I’m studying with OBOD. Any good tours? I’ll be leading a tour of Northern Ireland in September of 2013. But if you need a good travel agent to help you with tours to Ireland and the UK call Harrigan Holidays. http://www.harriganholidays.com/ They are the agent that we use. Best wishes for a great tour – whatever you decide. Beautiful post..I especially love Beltany Circle. Whenever I even see a picture of it, the tears start to flow…thank you.. I know what you mean, Charlene. Beltany draws on the emotions. A very powerful place.